ONTARIO – Premier Gold Mines of Thunder Bay, ON, has released more results from its successful drilling program at the Hasaga project in the Red Lake district. 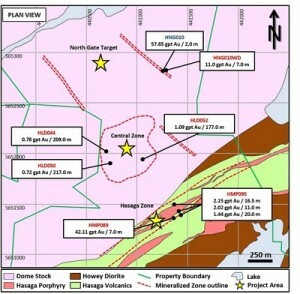 The near surface mineralization in the Hasaga porphyry and Central zone is expanding, and initial results from the Northgate target are encouraging. Plan view of primary drill target areas at Hasaga. 42.11 g/t Au across 7.0 metres in the H1 zone beginning at 25.0 metres downhole, including 285.0 g/t across 1.0 metre beginning at 30.0 metres. Multiple intercepts including 2.15 g/t Au across 16.5 metres in the H1 zone, 2.01 g/t across 11.0 metres in the H2 zone, and 1.44 g/t across 31.0 metres in the H3 zone. 0.78 g/t Au across 209.0 metres at the Central zone target area beginning at 51.0 metres downhole and includes 1.14 g/t across 40.0 metres beginning at 172.0 metres. 0.72 g/t Au across 217.0 metres beginning at 44.0 metres downhole and includes 1.05 g/t across 61.0 metres beginning at 44.0 metres. 1.09 g/t Au across 177.0 metres beginning at 9.0 metres downhole including 5.10 g/t across 17.0 metres beginning at 75.0 metres. Premier says the Hasaga property is located along a regional trend that hosted several historic gold mines including Hasaga, Gold Shore, Howey and Madsen. Readers wishing to speak with Premier president and CEO Ewan Downie may call 807-346-1381.